The hubs and I have been sleeping on a Queen size mattress since we moved in together back in 2008. He's 6'4" and I'm 5'10", so we always knew we wanted a King size mattress for extra comfort and, of course, the extra room. Fast forward to a dog, a cat, and two little ones with an abundance of morning snuggles and you can imagine how crowded our little Queen bed was. Did you know that we spend over a third of our lives in bed?! Crazy, huh? It totally makes sense though, even more now that we have a bigger family. A few weeks ago I was introduced to eve mattress. The moment I uttered the brand name to Justin (the hubs) he immediately cut me off and said, "Wait, eve mattress?! The mattress that comes in a box?! Those mattresses are SO good!!" Well, I'm sure you can tell from that comment alone that he was beyond excited, so his excitement immediately made me excited too! We were finally going to get our King mattress and this one had the best reviews online AND even had a great price point. 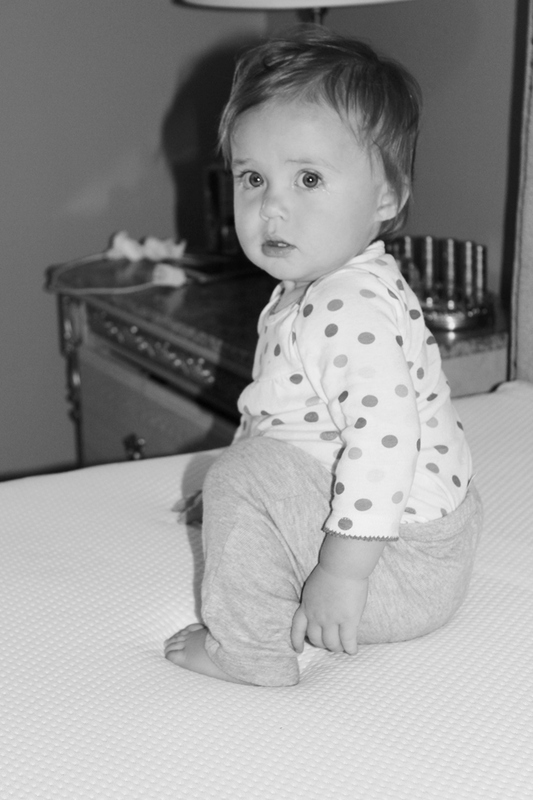 eve mattress is based in the UK, but as of November it is now also being sold in the U.S. eve mattresses are high quality and are sold at a fraction of the cost of a usual high-end mattress, so we were beyond excited to receive one. What's also really great about the eve brand is that they offer a 100 Day Mattress Trial, so if you aren't pleased then you can have it picked up and eve will give you a full refund, no questions asked! We all know that a good night's rest not only makes us feel good, but it's scientifically proven to be vital for our heart, weight and mind. eve's philosophy is 'every great day starts the night before' and that couldn't be more true! If you don't have a good night's rest then you can't possibly have a good day ahead of you. It's difficult to concentrate and it can put you in a bad mood (hence the old saying, waking up on the wrong side of the bed). Our old mattress was getting to be SO uncomfortable to the point where we both were tossing and turning and not getting the good night's rest that our body's craved and desperately needed. When our eve mattress arrived, it was indeed in a box, just like Justin had mentioned. I couldn't believe how compact the box was for such a large mattress. It was so easy to open and setup. It took mere minutes to get the mattress out of the box and placed on the bed frame. Upon opening it we could hear the hissing sound of all the air being released, and we watched the mattress begin to rise and fill out. I immediately noticed how soft the mattress was and also how sleek the design was. It's simple, yet beautiful. Every element of an eve mattress has been carefully designed and crafted by a team of British designers and mattress experts, from the beautiful box (which we loved as well!) to the inserts. Every aspect of the journey is simplified. From the moment the order is placed, to the shipment and arrival into your home. The eve mattress is a foam mattress and combines 3 different types of foam to make it one incredibly comfortable mattress. The bottom layer is a 17cm ultra-resilient base foam, the middle layer is made from 4cm highest quality, luxurious memory foam and the top layer is 4cm natural latex which is antimicrobial and adds bounce. This sandwich makes for an incredible cloud-like sleeping experience, supports in all the right places and helps prevent aches and pains. We've been sleeping on it for a little over a week now and no more tossing in turning for us! I was also experiencing back pain with our older mattress and now my back feels so much better. We also really loved how either of us could get up in the middle of the night without disturbing the other. That's a huge plus. Our sweet cat, Cali, jumped on the mattress right away and I could tell from her face that she gave it two thumbs up. :) Of course, our daughters thought it was the best trampoline ever! 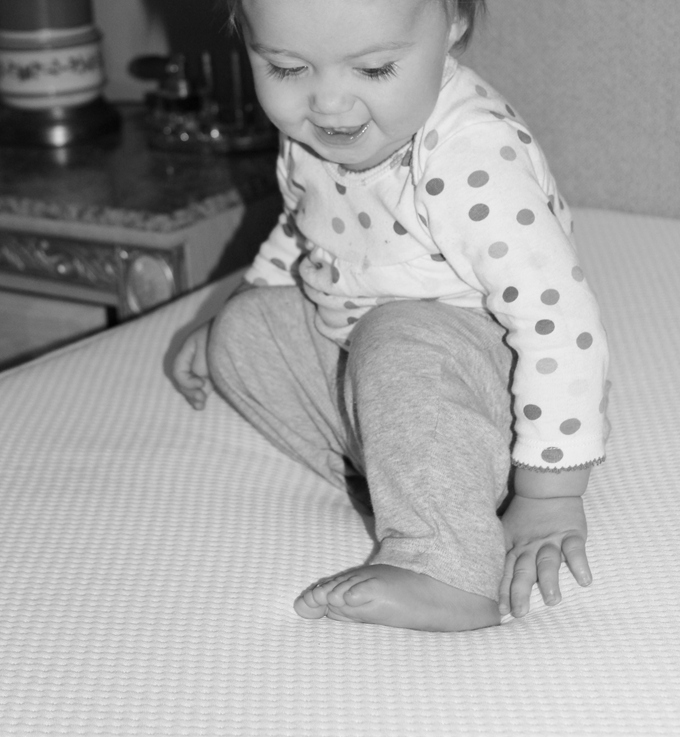 eve's luxurious layers of supportive memory foam are bouncy and so soft, so the girl's were immediately drawn to it. Justin and I also love how the mattress is breathable and has an anti-microbial natural latex top. Check out the eve mattress website to see how you can get $100 off a mattress for yourself!